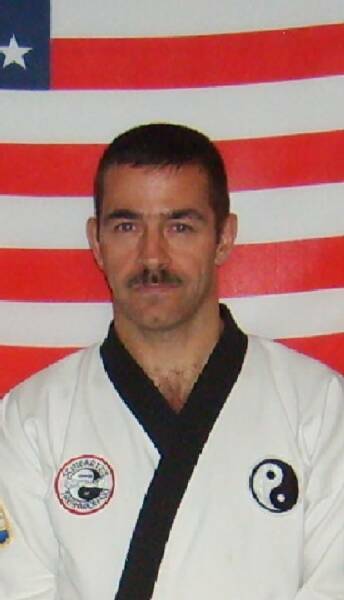 In February 1988 Mr. Schwartz met Mr. Terry L. Campbell and began training at Campbell's School of Tae-Kwon-Do and Self Defense in Dillsburg, Pa. With over 4 years of previous training in the martial arts combined with a routine of daily training and practice, Mr. Schwartz quickly advanced up through the belt ranks. On April 8, 1989, during a belt rank promotions test conducted in Dillsburg, Pa. Grandmaster Dong Hi Choi personally promoted Mr. Schwartz to the rank of 1st Degree Black Belt. For the next 18 months Mr. Campbell trained Mr. Schwartz in all aspects regarding operating a martial arts school and in January 1991 Mr. Campbell promoted Mr. Schwartz to the position of Head Instructor at Campbell's School of Tae-Kwon-Do and Self-Defense in Dillsburg, Pa. Under Mr. Schwartz's leadership the school continued to grow and was consistently recognized as one of the best schools in the Harrisburg area. In September 1991, following the death of his father earlier that year, Mr. Schwartz returned to the Scottdale area moving back into the farmhouse he grew up in. After extensive renovations to the building that his father operated a meat cutting business out of, Mr. Schwartz opened his own school "Schwartz's School of Tae-Kwon-Do" on April 26, 1993. Mr. Schwartz believes in working with each student to help him/her realize their maximum potential and earn their Black Belt regardless of their age, gender, race, religion, or natural ability. Mr. Schwartz retired from the PA Department of Corrections (DOC) in 2004 after 19 years of service to the commonwealth. During his career he served as an Instructor for the department and taught fellow officers Basic & Advanced Self-Defense, Baton, First Aid, CPR, Pepper Spray, Stun Gun, and Riot Control. Additionally, Mr. Schwartz was certified by the DOC and the NRA as a Handgun & Shotgun Instructor. He also served 7 years as a member of the Departments elite statewide Hostage Rescue Team. In 2001 Mr. Schwartz received the Department of Corrections distinguished Medal of Valor Award for his actions which resulted in saving the lives of (3) fellow Corrections Officers. Since retiring from the Dept. of Corrections, Mr. Schwartz is a full-time martial arts, fitness, and self-defense instructor and has been involved in the training of several local police S.W.A.T. teams. Mr. Schwartz has considerable experience judging and competing in Martial Arts tournaments. He has also competed in a number of full-contact boxing, kickboxing, grappling, and toughman events. In his spare time Mr. Schwartz enjoys distance running and competes in many local running events. He has completed numerous marathons, ultra marathons, and adventure races. Glenn A. Schwartz is a 5th Degree Black Belt who has studied the Martial Arts since 1983 and has been teaching Tae-Kwon-Do since 1989. Mr. Schwartz began his martial arts training in 1983 at the Scottdale YMCA where he studied Chinese Kempo. In October 1985 Mr. Schwartz accepted a position as a Correctional Officer at the State Correctional Institution at Camp Hill and relocated in the Harrisburg area where he sought to continue his martial arts training. During the next two years Mr. Schwartz studied several different styles of martial arts including Kung-Fu.